Vaz Zastera is excited about his new line of optic glass jewelry. Vaz precision crafts the jewelry himself with professional equipment. The optic glass has a ten-layer reflective coating that is applied by The Monolith in a vacuum deposition chamber. The glass is then cut, ground, and polished to enhance its light refraction. 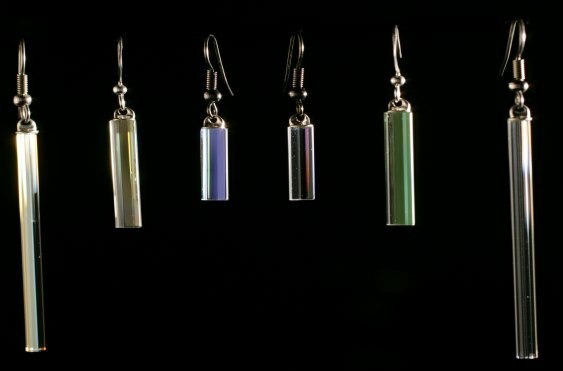 Interference of light in the thin-film coating results in reflections of different colours. Jewelry is available in four different sizes: 0.75", 1.0", 1.5", or 2". Each piece has either 4, 5, 6, 7, or 8 facets. The finings are made from hypo-allergenic stainless steel.